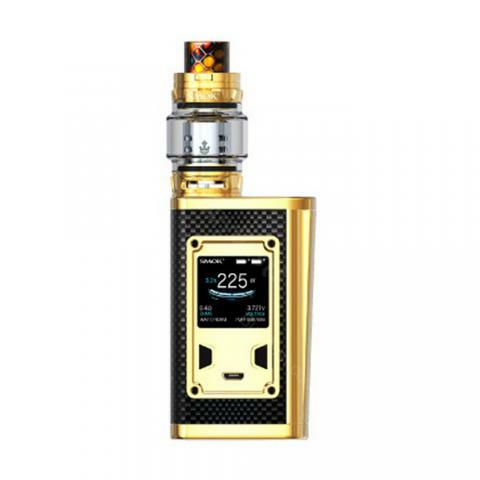 The SMOK Majesty TC Kit Luxe Edition is a newly introduced setup for high power vaping. It combines a new Majesty box mod Luxe Edition with a TFV12 Prince tank, making a perfect match no matter in appearance or performance. The SMOK Majesty is a compact yet powerful device featuring the regular three button operation system, a large color screen with upgraded UI and 225W max output power. The TFV12 Prince is a sub ohm tank with 8ml/2ml e-juice capacity, rotary top fill system and dual adjustable bottom airflow. This is Carbon Fiber Version. Here comes the new Luxe Edition SMOK Majesty TC Kit which is designed for high power vaping. It combines a new Majesty box mod Luxe Edition with a TFV12 Prince tank, making a perfect match no matter in appearance or performance. The SMOK Majesty is a compact yet powerful device featuring a black cobra and a carbon fiber finish for your choices. The Majesty Luxe Edition runs on dual 18650 batteries that can fire up to 225W max and support various TC wires. It adopts a large color screen with upgraded user interface that provides detailed data display and easy operation system. Together with the 8ml/2ml TFV12 Prince tank that features a convenient rotary top fill system with locking mechanism, dual adjustable bottom airflow and powerful coil heads, the SMOK Majesty TC Kit is a good choice for you to enjoy massive flavorful clouds. • It doesn't come with e-juice or 8650 battery, which you need to buy separately. • 510 thread and 3 months warranty. • Quick links: Majesty MOD ; TFV12 Prince Tank ; 18650 battery. I waited so long for the original and beautiful product .Very satisfied. Schnell aufladbar, schönes handling einfach zu bedienen und sieht wirklich klasse aus. SMOK Majesty ist super! This is original smok majesty product, I have checked it.